Experience Salmon Fishing on The River near Fort William. 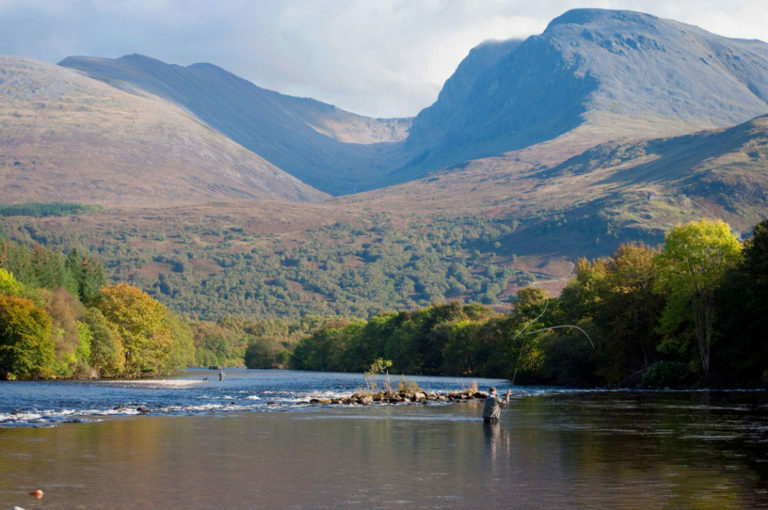 The River Lochy offers the some of the most scenic salmon fishing in the Scotland, with it’s spectacular views of Ben Nevis (The highest mountain in the UK) it is no wonder that the late great John Ashley-Cooper crowned The River Lochy as “The Queen of Scottish Salmon Rivers”. As well as it’s spectacular scenery, The River Lochy is also well known for it’s run of large Spring Salmon with an average of 15-17lbs and a history of bigger fish of up to 40lbs so there is a real chance of a fish of a lifetime! The fishing on The River Lochy is made up of 4 beats which are rotated every day so variety is guaranteed as you will get to fish three of the four beats over your three days. If you would like to experience the whole river then our six day package will take in the whole river and an extra 2 days on the initial beats.